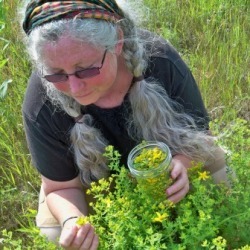 Relocation, as a bioregional herbalist (one who chooses to incorporate the plants that grow nearby) has proven for me to be an opportunity to connect with new plants on an intimate level. One of those plants is Monarda fistulosa, commonly known as Bee Balm or wild bergomot. While I grew Monarda didyma in my garden while living in Seattle, I did not harvest very much, as there were only a few plants. I occasionally harvested petals for salad and that was the extent of it. I had of course read about the healing qualities but was utilizing other more abundant plants for the purposes that I have since applied to bee balm. Since relocating and getting to know the ever abundant midwest native Monarda fistulosa, I have begun harvesting this plant in abundance. I incorporate her spicy leaves and flowers into salads, vinegars and honey. I dry the plant for infusions (steeped 2 hours for flowers) and enjoy her ever fragrant flowers in sachets. Monarda is a plant in the Lamanicea or mint family. The plant is aromatic and grows in what botanists call a subshrub pattern, in other words large clusters. Wild bergamot was also considered a medicinal plant by many Native American people including, (but not limited to) the Menominee, the Objibwe, and the Winnebago. It was used most commonly to cure colds, and was frequently made into a tea. Today, many families still use wild bergamot during the cold and flu season. It is often sweetened with honey to subdue it's strong flavor. Bee Balm has strong antiseptic qualities which stem from the fact that this plants contains thymol, or thyme oil. It can be applied for cleaning minor wounds and/or skin infections, as a mouth rinse for throat and mouth infections and it has been used as a carminative (an herb that reduces or expels gas). This plant also contains anitfungal qualities. While living in the Pacific Northwest, Red Cedar was one of my favorite plants for clearing fungal infections including athlete's foot. Today Mondarda is my choice. In many of the talks I offer, I speak to the need for choosing plants that grow around us. Many of use are familar with the concept of local food, yet few of us stop to think where our remedies come from. Historically people had everything they needed right around them and we can too. Many of the plants that we use, which come from afar can be replaced with plants that grow right in our own bioregion. -Harvest the flowers of this plant when they are in full bloom. Follow the bees they will lead you there. Ask persmission, if granted thank the plant. I like to thank the plant by breathing and singing with it. Sharing breath is the greatest gift we can offer our green allies, acknowledging and keeping in our consciousness our dependence on them for every breath we take. -Place the flowers in a jar. Filling and packing the jar lightly. -Once the jar is full, pour apple cider vinegar over the plant. I prefer organic raw vinegar. -Place a lid on the jar. I have been using plastic canning jar lids, as they will not rust. -Label the jar, with the common name, botanical name, date and any other pertinent information. -Place the jar in a dark place. -Strain in 4-6 weeks. Store in a dark place. -Enjoy this on salads, in water to create a refreshing beverage and/or soak your feet in a diluted foot bath to clear up athlete's feet. Many wonderful uses!